This entry was posted in Brand Spotlights, News - Musings, Shopping, Style Guides and tagged alexandre matussi, ami, double breasted overcoat, overcoat by Fok-Yan Leung. Bookmark the permalink. Yeah, it’s nice but when you’ve found one as wondrous as the dark blue Crombie… Let me know. Can you explain why folks would scoff at 32 ounce wool? I’m clearly not a purist. I love 32 ounce wool, but a lot of guys find it too heavy for comfort these days. Not me, but a lot of guys. Fok-Yan, I just ordered the last one on Mr. Porter! Can’t wait to try it out. The note about the 32 ounce wool is what sold me–I live in really cold territory. 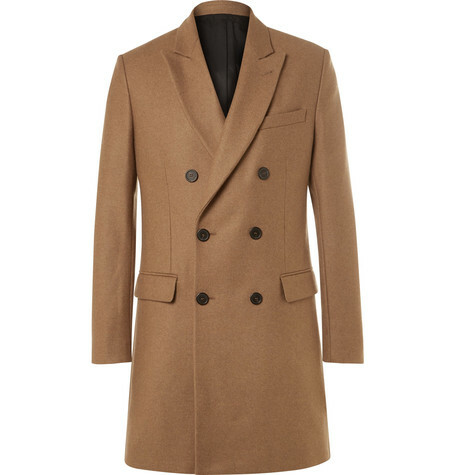 I was torn about getting this one vs. the SuitSupply db camel coat. I wear 40R suits, so hopefully there is some room to be a true topcoat. Any other thoughts since you’ve now gotten to try it in the winter? I purchased this Ami coat after reading your review but very disappointed at the quality of the coat. Did not expect much from 80% wool 20%poly but it feels so cheap and not worth half the price of this coat. Yeah, I would have to agree. It was rougher than my cheap Banana Republic coat. Worst part was that it stunk like chemicals, like nothing I’d ever experienced. My kids wouldn’t even stay in the same room. I returned it right away and will never order another Ami product.